As the number of dead climbs higher, the race to find survivors intensifies. 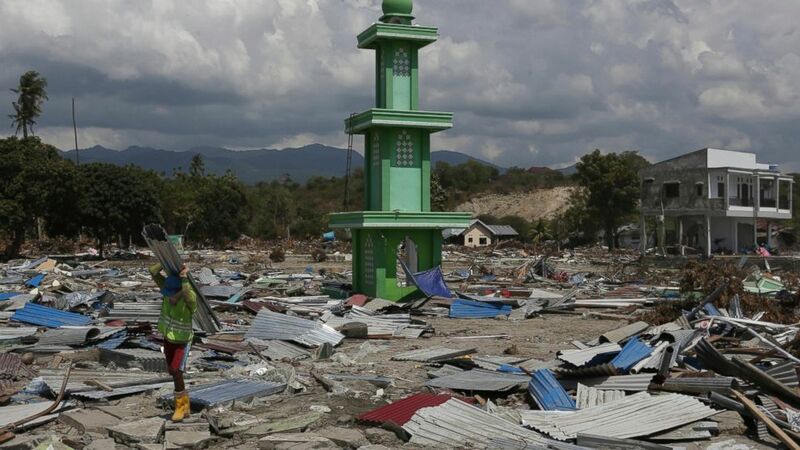 The death toll for Sulawesi’s earthquake and tsunami last Friday has risen to more than 1,200, according to Indonesia's national disaster agency. The announcement came as survivors in the stricken city of Palu grow increasingly desperate for water, food and essential supplies. The damage to roads and infrastructure in the region has prevented much-needed aid from reaching critically-damaged areas. While members of the military have been able to assist several humanitarian relief convoys and air deliveries, the number of people in need is presenting the Indonesian government with a vast logistical and humanitarian challenge just a month after another island was jolted by an earthquake that killed 430 people. Police are having to deal with a delicate security situation as desperate residents have crowded convoys and scuffles have broken out as people fight for limited but critically-needed supplies. Stores and gas stations have been looted and cleared of basic goods -- leaving desperate survivors waiting and hoping for aid supplies to make it north. "We have not eaten for three days," one woman cried as a cargo plane's pilot chose not to land on Sunday at Mutiara SIS Al-Jufrie Airport in Palu, because the it was overrun by hungry residents. There have since been successful deliveries of rice and water to the airport, but the humanitarian missions are reliant upon police escorts and distribution by soldiers to manage the crowds of tired and hungry survivors. As rescue workers and volunteers continue the daunting task of sifting through wreckage in Palu to search for survivors, satellite images reveal the vast scale of the devastation following the 7.5-magnitude earthquake, which sent waves of nearly 20 feet flooding through the coastal city. The images offer stark contrasts with photographs dated before and after the twin disasters. They show residences and shops lining the coast remain submerged days after the waves first hit Palu in northern Sulawesi. 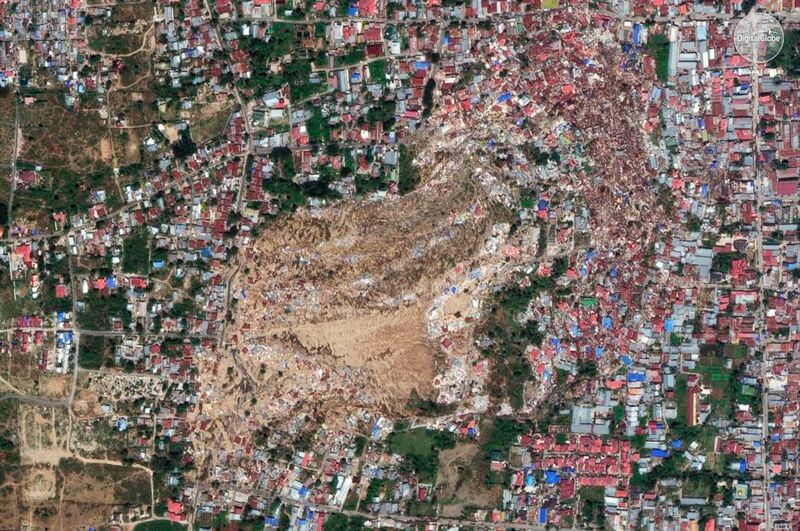 Below, Palu's Petobo neighborhood is seen on Aug. 17, and then again on Monday. 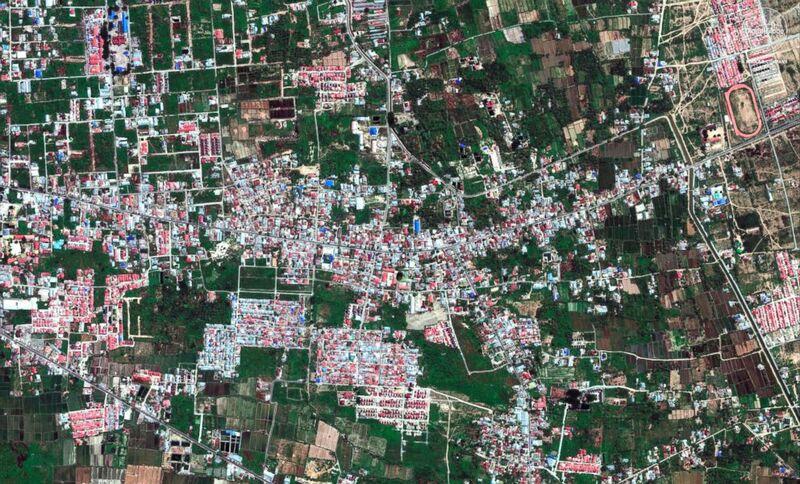 (DigitalGlobe, a Maxar company via AP) A satellite image taken Aug. 17, 2018 shows the Petobo neighborhood in Palu, Indonesia. 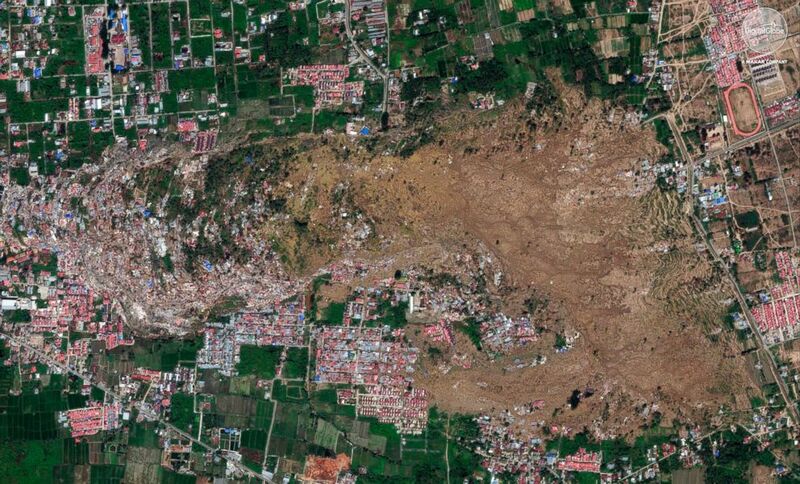 (DigitalGlobe, a Maxar company via AP) A satellite image provided on Oct. 1, 2018 shows the the Petobo neighborhood in Palu, Indonesia, after an earthquake and subsequent tsunami caused substantial damage and liquefaction in the village. In some images the effects of liquefaction -- where the vibrations and tremors in an earthquake cause the ground, and everything built on it, to ripple and move like water -- and landslides is stark. Large swathes of multi-colored homes in the Balaroa neighborhood, seen below on Aug. 17, were captured Monday after they disappeared under a sea of brown mud. (DigitalGlobe, a Maxar company via AP) A satellite image taken Aug. 17, 2018 shows the Balaroa neighborhood of Palu, Indonesia. 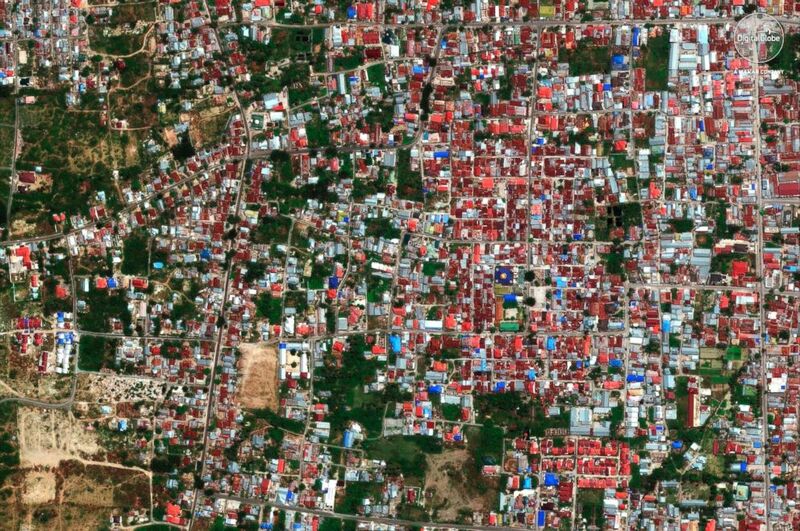 (DigitalGlobe, a Maxar company via AP) A satellite image provided on Oct. 1, 2018 shows the Balaroa neighborhood of Palu, Indonesia, after an earthquake and subsequent tsunami caused heavy damage to the area. There are still hopes that people may yet be alive, buried under rubble across the region. There are large areas in the remote north that are still inaccessible to rescue teams. 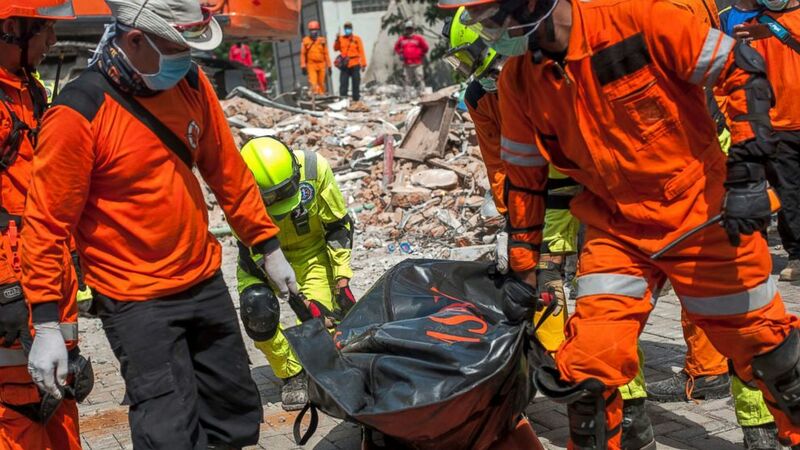 (AP) Rescuers recover the body of an earthquake victim from the ruins of the collapsed Roa Roa Hotel in Palu, Central Sulawesi, Indonesia, Tuesday, Oct. 2, 2018. In a heartbreaking development Monday, the bodies of 34 schoolchildren were discovered by Indonesian Red Cross officials in a church that was buried by a landslide. There were around a hundred students who were taking part in a Bible camp in Sigi province, south of Palu city. (AP) A man carries recovered items from the damaged warehouse from Friday's tsunami at a neighborhood in Donggala, Central Sulawesi, Indonesia, Tuesday, Oct. 2, 2018. 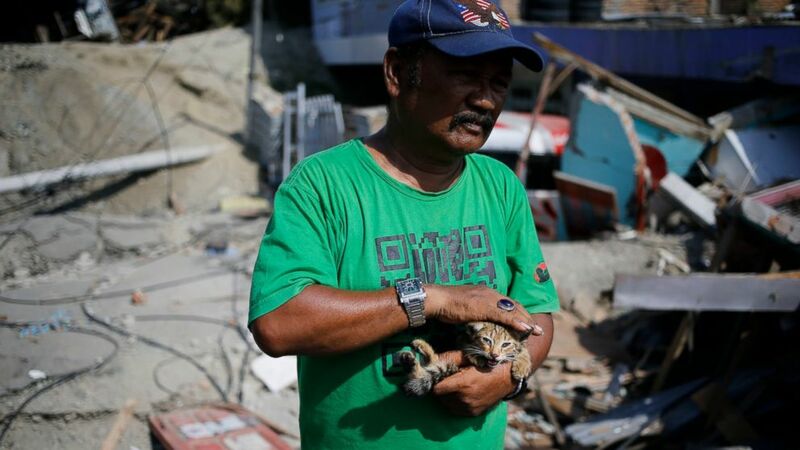 (AP) Sa'adon Lawira holds his grandson's cat whose miauw helped him finding his body which was buried under the rubble of the family's house in Balaroa neighborhood in Palu, Central Sulawesi, Indonesia Indonesia, Tuesday, Oct. 2, 2018.